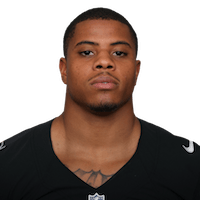 Published: Dec. 3, 2017 at 07:02 p.m.
Oakland Raiders running back DeAndre Washington runs through tackle to score a 9-yard touchdown. Published: Oct. 29, 2017 at 03:50 p.m. Published: Oct. 19, 2017 at 10:30 p.m.
Oakland Raiders running back DeAndre Washington refuses to go down on this 4-yard touchdown. Published: Dec. 24, 2016 at 06:02 p.m.